Kendrick slings it deep down the right side on 2nd down. Kendrick loses 11 on a sack. Didn't hand the ball to Pooka on the play and blitz was coming right at him. #KUfball punts for 3rd time on 4th possession. Kendrick's pass looms large. Evan Fairs had his man beat on second down, and Kendrick underthrows him. KU punts. How are we not even competitive in this game? Have not tried the delayed draw for Pooka even once. Not giving the ball to Pooka once on the last drive was questionable. Whoa. Fleeks beats 2 KU safeties, Defense and Miller, to back of end zone on Brewer's 3rd TD pass. Baylor up 23-0. Extra point was no good. Sounds like David Beaty's two week absence is over. 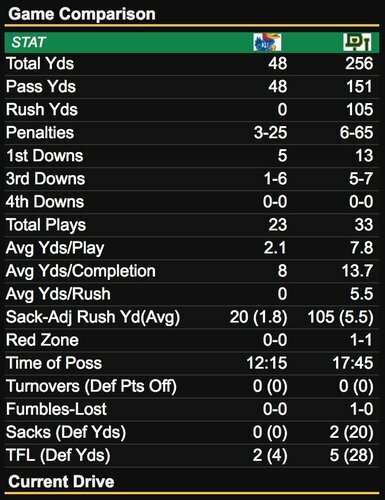 The ugly numbers from KU's 1st half at Baylor. Muffed punt, but missed opportunity by KU to change the momentum. Quite obvious the lack of arm strength of KU QBs versus Baylor’s. Baylor prevented KU big plays on the ground exposing the poor passing ability. Safe to say Beaty is back and we’re back to our losing ways. 0-9 in the Big12! It was fun watching them win two games but it was so obvious we had played no one. The two teams we beat are in the bottom 10 in the country. Just get this over with so a new staff can come in because we’ve got some talent that a new staff could coach up. So many fundamental problems on both sides of the ball. Our linemen are a step slow and our receivers can not get separation. We play zone secondary and stand like statues. I have always felt people should get a fair chance but please dismiss Beatty at half time and give him a ticket home! Writers wondered what would happen when Baylor stacked the box and forced us to throw, or at least to run something different. I guess we know now. Recievers not getting seperation, passers not too accurate- Draws, screens second half? I think screens to Pooka, particularly on first down, makes a lot of sense against stacked boxes. More Miles Kendrick to open 2nd half. It's 3 and out for KU to open 3Q. Baylor will punt on first possession of 3Q. Busts a LONG run down the right sideline before being brought down inside the 10. And it's Bender at QB down in the red zone. Potential TD pass for Kerr Johnson off the mark on 1st down. 3rd down pass is the type Bender is expected to make. Puts it on the money for Jeremiah Booker in the back left corner. #KUfball finally on the scoreboard in 3Q. Need to stick with Bender the rest of the game. He gives us the best chance at winning. Martin FG from 27 yards pushes BU lead to 26-7. 9-play, 65-yard scoring drive for Baylor.